Stellar Four: Finishing "The Other Way"
by Meghan B. and Kathy F.
Adorable, clever, fast-paced action, with new vibrant characters and some old faces, Etiquette & Espionage more than delivered. Gail Carriger has given us a treat. This might technically be a young adult book, but it still carried the same wit we loved in the Parasol Protectorate series. 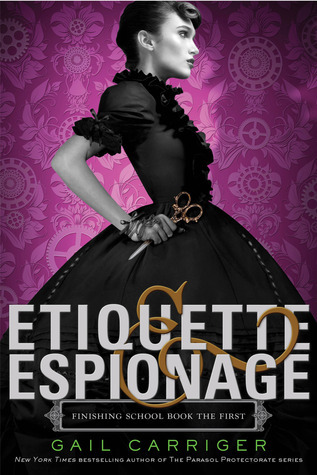 Set a generation before the Alexia books, we follow Sophronia as she enters Mademoiselle Geraldine's Finishing Academy - a school that defies every one of her expectations. Blurb: "It's one thing to learn to curtsy properly. It's quite another to learn to curtsy and throw a knife at the same time. Welcome to Finishing School. Sophronia Temminnick at 14 is a great deal more interested in dismantling clocks and climbing trees than proper manners -- and her family can only hope that company never sees her atrocious curtsy. Her poor mother, desperate for her daughter to become a proper lady, enrolls the lively tomboy in Mademoiselle Geraldine's Finishing Academy for Young Ladies of Quality. But young ladies learn to finish...everything. Certainly, they learn the fine arts of dance, dress, and etiquette, but they also learn to deal out death, diversion, and espionage -- in the politest possible ways, of course. Sophronia and her friends are in for a rousing first year's education." Just lovely. The colors pop, the dress is divine, and love the scissors held in a defensive stance. This girl is ready to finish whatever someone throws at her. The cover of book 2 is divine as well. These are ones that scream "Buy me in hardcover!" so you can enjoy the pretty on your bookshelves. Next, how much fun was it to see some characters in their younger years? It was a treat. Not going to tell you who you will meet. That would spoil the fun. Have our fingers crossed for characters that might pop up in book 2. Sophronia is more than a capable protagonist. With a quick intellect, advanced climbing skills, a winning smile and the ability to make friends in the most unlikely places, she is a force to be reckoned with. Action-wise we have a prototype that has gone missing, battles with flywaymen (that would be highwaymen who take to the air), and intrigue within the airship halls of the flying Academy. It is up to Sophronia and her friends to reach the prototype first and prove they have what it takes to finish "the other way." Also of note, this is a young adult book with no romance. The seeds have been planted for perhaps something in the future, but that is as far as it gets this round. We have to wait until November for Curtsies & Conspiracies - not a long time when you consider most series. I still need to read this book! I've read up to Blameless in her adult series, must finish that series as well. 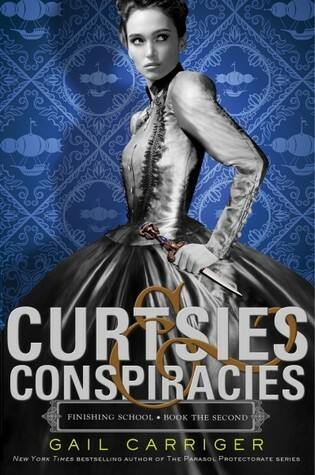 OMG, I am jonesin for some Gail Carriger movies or TV shows about now!